Cold Air: Data Da duh... What are we trying to do about fossil fuels? Data Da duh... What are we trying to do about fossil fuels? It has been a while since I posted to this site, in part because of I've kept busy with my other sites; Cold Air Currents, where I collect, and comment, on articles of interest; and my data reporting site which provides a web portal for some of the views I've created in analyzing Ontario's electricity sector. For this post I'll use data from my weekly reporting project to illustrate the value of the fossil fuel villain in electricity generation. The province of Ontario has been publicizing a desire to eliminate coal for over a decade, and actually looking at the role coal plays in the generation system is helpful in both demonstrating why it's been difficult to discard, and why recent reports are showing the expense involved with attempting to do so. 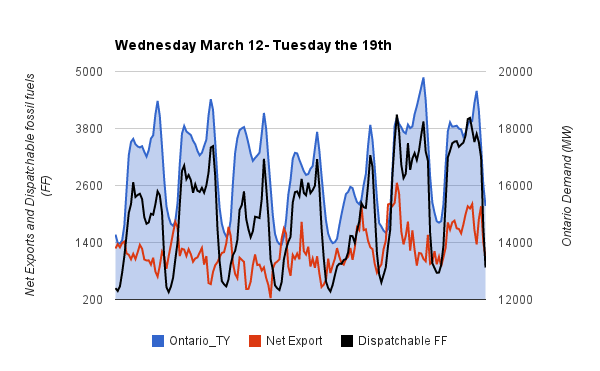 To illustrate a role played by coal, and natural gas, generation, I created a graph showing the most recent week's hourly Ontario demand (as defined by the IESO) on the right axis, along with the hourly net exported energy and the energy from dispatchable gas and coal generators. This chart emphasizes a lot on the subjects I've written about it the past, including the systemic cost of introducing, on a must-take all production basis, generation with little capacity value. The graph demonstrates that when power is demanded, the fossil fuel generators produce it. In Ontario we claim to be replacing coal with generators that do no such thing - planning on building out 10700MW of wind and solar generation with the stated purpose of replacing ~7500MW of coal-fired capacity (in 2003, when the promise to phase out coal, by 2007, was promised, by the victor, during an election campaign). The high cost of generation with little value was the topic of this week's Counting the Hidden costs of energy" Indicates Much Higher Cost of Wind and Solar, which noted studies comparing the systemic cost of a variety of generation sources. Globally, there is a general refrain from proponents of sources with little capacity value that they are replacing coal. If we look at the same data set as above, presumably replacing the fossil fuel fired generation that coordinates with the demand spikes would be the task being attempted. 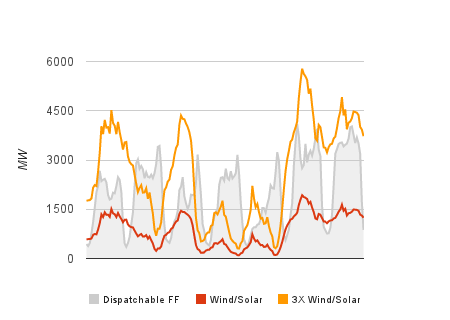 This particular week the output of renewable would eliminate the need for fossil fuel dispatching during the hours they saw peak use, but even adding the next planned 7500+ MW of renewable supply, three times the current 2500+ MW, wouldn't have eliminated the need for fossil fuel supply to match demand - producing very little at the peak gas/coal usage on 3 of the 7 days. A second trend it's possible to spot on the initial graph is the growth of hourly net exports concurrent with the growth in generation with coal and natural gas. There has been a popular perception that Ontario's low-priced exports have been driven by an excess of baseload generation. 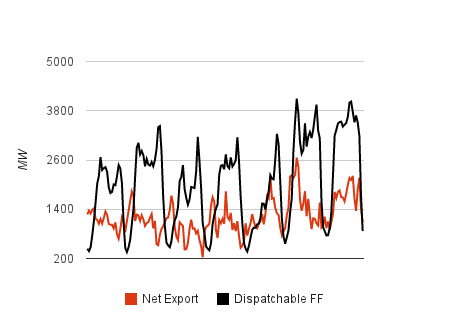 That's not entirely wrong; during the low nighttime demand net exports do exceed the generation from dispatchable natural gas and coal generators. It's clear generation from gas and coal are being driven higher by exporting more during higher demand periods. Encouraging local production of electricity with these plants contradicts a goal of reducing airshed pollutants in Ontario - not that I agree with the hysterical talk on the health impacts of either coal or, more notable this week, natural gas-fired generation (this week I also posted Comments on Gas Plant Scandal: Before and After). ...there is clear evidence in systems with high penetration of RES-E [Renewable electricity standard for Europe] that security of supply threats are not necessarily in adequacy alone but rather flexibility, voltage control and transient stability. These issues are more complex and require thorough technical analysis. It is only on the basis of appropriate technical analysis that meaningful and effective enhanced market mechanisms can be developed. ...the Nanticoke station provides voltage support necessary for power flows to the GTA. Not only is replacement generation required on-line, but substantial transmission changes are also required to facilitate the shut-down of Nanticoke. The IESO is continuing to assess the need and timing for some Nanticoke units to be converted to operate as synchronous condensers, which provide reactive power without burning coal to operate. The complexity of what is required to replace coal, and, presumably natural gas afterwards, are noted in ENTSO-E's paper - which has an advantage over planning in Ontario in that it is addressing the issue of accommodating the growth of intermittent generation on the grid to the extent that Europe's politicians have stipulated must be accommodated on the grid. Notably, in Europe, where increasing generation from renewables is specified as the challenge, coal is growing it's share of generation as residential energy costs rise. There are a number of natural gas-fired generators in Ontario that run 24X7 - for a variety of sane reasons, such as coming from cogeneration facilities They produce approximately 1000MW each hour, but are excluded from the first chart in this post. Also known as capacity credit, the reference is to the amount of generation the system can rely on the unit to provide when needed (ie. a 400MW gas turbine would be expected to produce 400MW when demanded while a 400MW wind installation might be expected to be producing 1/10th of that). I explored this topic in Ontario's Billion dollar subsidies of Gas-fired Electricity Generation, where I argued generators awarded net revenue guarantees sell into the spot market at price levels that exclude capital cost recovery provisions - the price therefore only reflecting the cost of fuel, these generators must be bidding into spot markets at cheaper rates than the generators in adjacent markets that need to recover capital costs from spot market revenues. I estimated the cost of these various capacity payments at ~$1.7 billion in 2012 - that's about 17% of the total value of Ontario's market, but the suppliers with capacity contracts only provide ~12% of our supply. The less utilized the plants are the more expensive the cost, as when the plants do generate electricity the incremental cost is only the cost of the fuel. The policy on renewables is a policy to use the plants less. That's why the generation only gets built if it has a capacity payment - and that's one more reason why the cost of expensive contracts with generators lacking capacity value has an enormous system cost. Also referenced on Cold Air Currents this week, MESA energy has claimed the local content provisions of Ontario's procurement rules for industrial wind generators, would hae added $100 million to the cost of it's Ontario projects. Your style is unique compared to other people I've read stuff from. Many thanks for posting when you have the opportunity, Guess I will just bookmark this blog. I'm really impressed along with your writing abilities and also with the format in your weblog. Is that this a paid subject matter or did you customize it your self? Either way keep up the excellent quality writing, it's rare to peer a great weblog like this one these days.